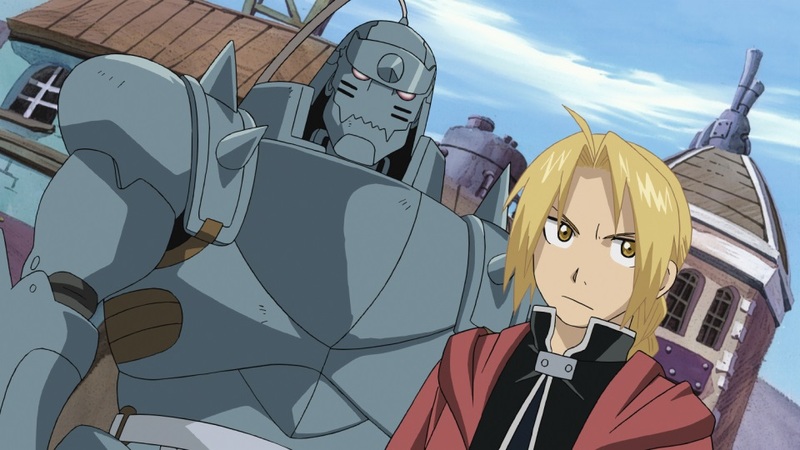 Fullmetal Alchemist is one of those series that you just can’t get around watching. If you love anime or are even just getting into it you usually start off with this one. It was actually the first anime ever recommended to me by a co-worker. She told me to watch Brotherhood and after watching it there was no going back. 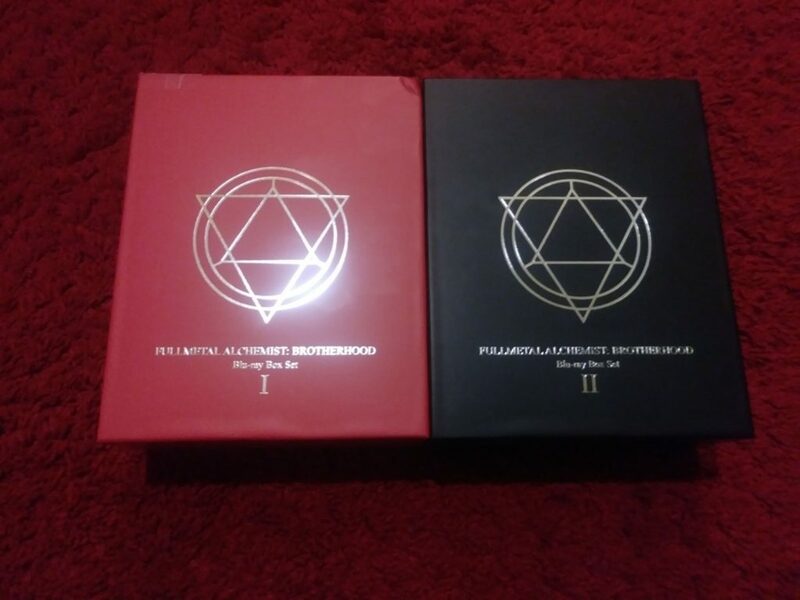 Recently Aniplex has come out with a couple of Box sets that are absolutely gorgeous. And Hefty, man these things are bricks. Beautiful, beautiful bricks. The front cover for both has a silver alchemy circle that has been embossed onto it. 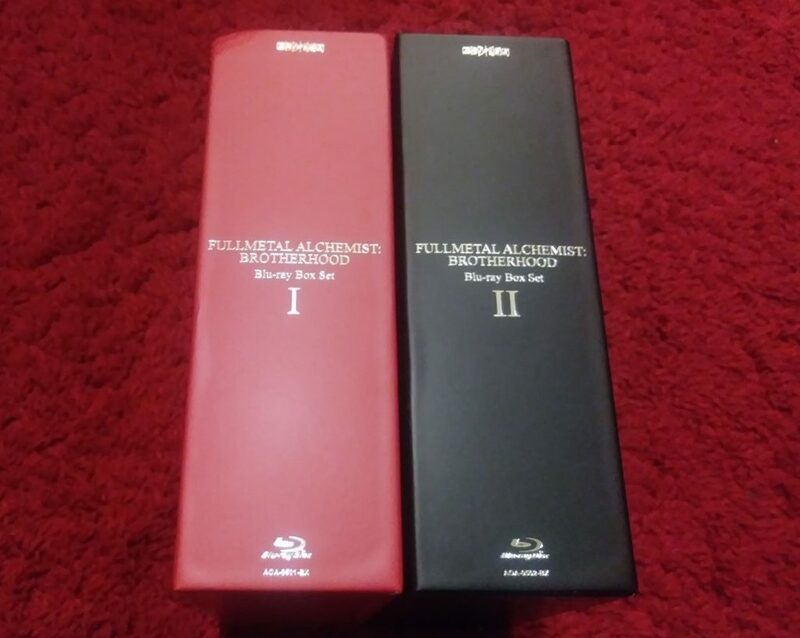 The spine has the title and the volume number embossed in silver and the back… Well the back has original artwork by Hiromu Arakawa himself. Each DVD comes with two discs except the case for disk seven which comes with the bonus features. Every cover for the cases are unique and picture what goes on in the episodes included on that particular set of discs. They put a lot of thought into the design for these sets and it shows that they really considered what the fans wanted. 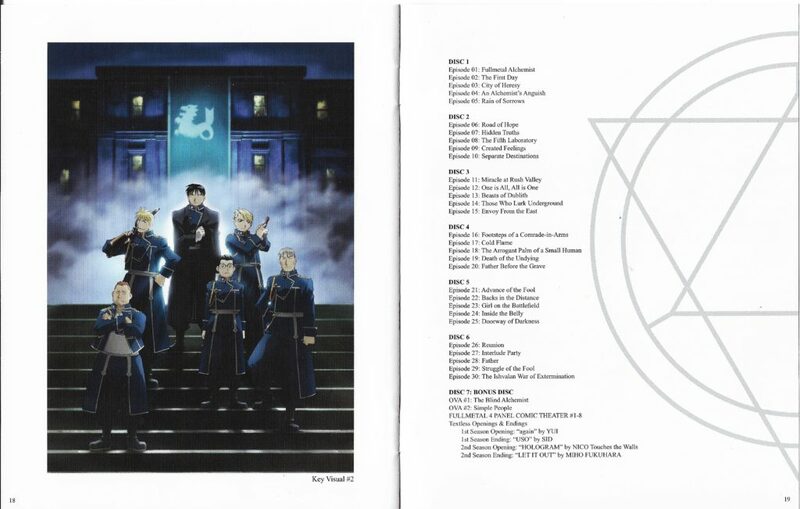 Included on the bonus disc for set one includes: OVA 1 THE BLIND ALCHEMIST, OVA 2 Simple People, FULLMETAL 4 PANEL COMIC THEATER 1-8, 1st and 2nd Season Textless Openings and Endings. 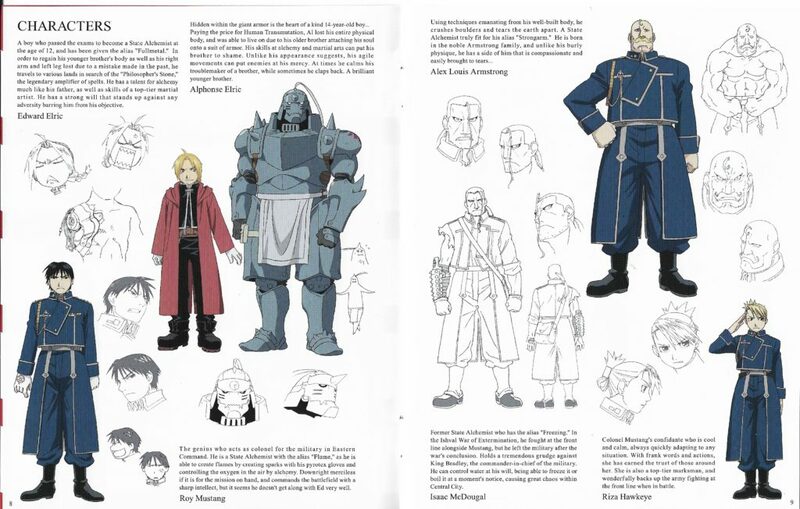 Included on the bonus disc for set two includes: OVA 3 A Master’s Tale, OVA 4 Yet Another Man’s Battlefield, FULLMETAL 4 PANEL COMIC THEATER 9-16, 3rd, 4th and 5th Season Textless Openings & Endings, Broadcasted Version Opening & Endings. 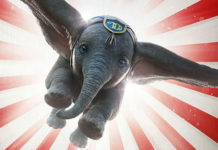 Each DVD Blu-Ray comes with both the Japanese and English Audio with optional English Subtitles. The show is streaming but I always prefer to have the DVD. 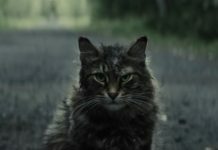 The quality is just better and you don’t have to worry about whether or not the internet is going to drop. The show is 16:9 HD Wide Screen and 1920 x 1080p. 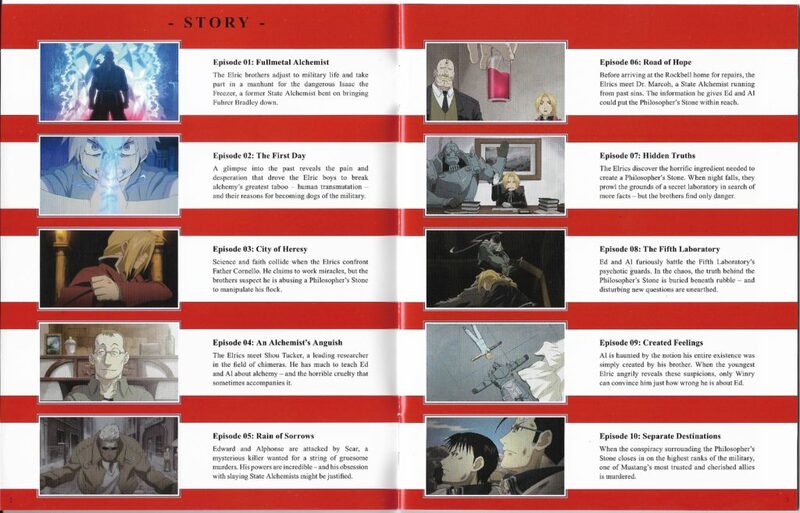 Not only that but with the inclusion of the OVAs you get everything from the series. I checked Hulu, Netflix, and Crunchyroll and none of the streaming services had any of the OVAs. I have to say that putting these on my shelf felt impressive. They definitely stand out and make my collection look nicer. 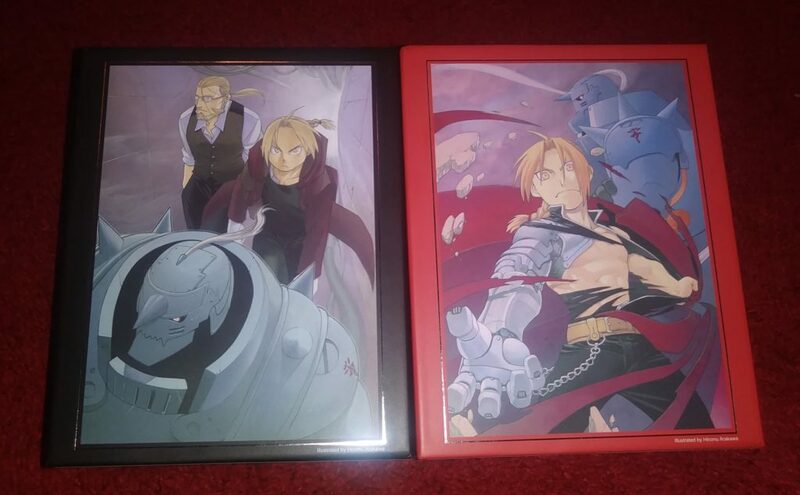 I think that any anime fan should have these in a home media version. One of the best things about anime is collecting either with toys, figures, manga or DVDs. These box sets are pure collectors items. They would be a great gift to yourself or to another person. I recommend them, and the price point isn’t too bad either. When you consider that I spent $60 for each part of the Sailor Moon Blu-rays so just under $100 each set of these is a great price. Especially for all that you get. You can check out the Blu-Ray Box Sets on Rightstuff here! 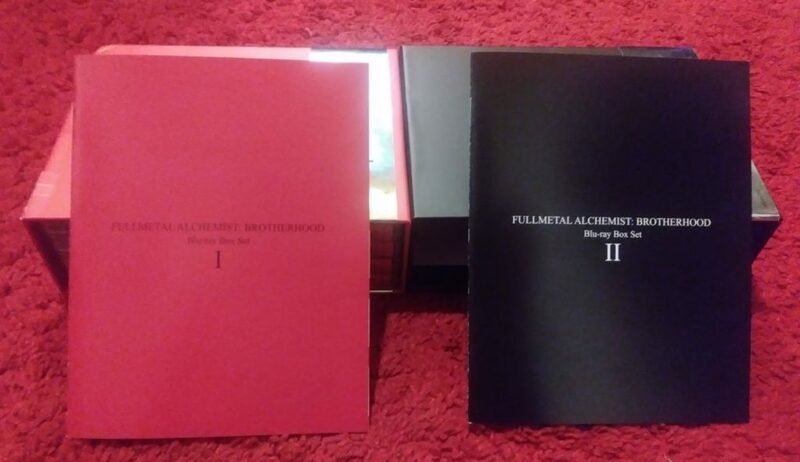 Do you enjoy Fullmetal Alchemist: Brotherhood? Tell us in the comments!